The Venture Bros. - The Fifth Season Blu-ray release is my first real introduction to The Venture Bros, and even though I started with the most recent season I wasn't too lost on what was going on. There is a lot of backstory that I'm eager discover but even without it the show is quite enjoyable. The show is hilarious with various types of comedy, from parodies to slapstick to geek references of many other sci-fi and fantasy shows, and more. As you may have guessed by now, it's also a very weird show and that could make it difficult for some people to get into. Thus, I'm not going to try giving summaries of any of the episodes as there's just no way I could do them justice. I was quite surprised that I enjoyed this show as I was never too impressed with the comercials, but what did disappoint me was that there were only 10 episodes. Most of the episodes are a half hour long, and I not only expected there to be more for a full season but I also really desired more. Why so few episodes?! The artwork isn't the best we've seen from an animated show, but then South Park proves you don't need awesome animation to be super funny. And like South Park, the simplicity of the animation can sometimes be the cause of humor. The audio on the other hand is pretty fantastic. It's in 5.1 surround and it's definitely noticeable how the sound travels between speakers and the action travels on-screen. There aren't any extra features here except for audio commentaries for each episode, which is a bit disappointing because I would have liked to learn more about this show and how it came to be made. Commentaries are nice but they don't really enlighten the viewer in regards to the show. It does come with a digital ultraviolet code for getting a digital version to watch anywhere, which is handy. It's a funny show and a good release, but I just really thought there could have been more. 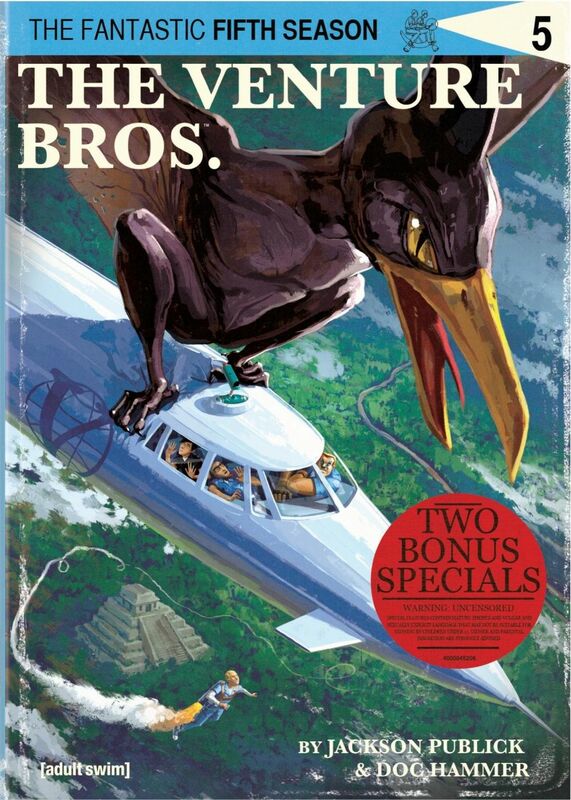 Venture Bros: Season 5 , released by [Adult Swim], is available starting March 4, 2014.